Another signal work from Arthur Ord-Hume. This substantial, hard-backed and fully illustrated volume spanning the life and works of famed Australian aircraft designer Edgar Percival is now available. Percival's Aircraft were known for the beauty and elegance of their design. The photographs in this volume bear witness to that fact and the addition of Arthur's expert commentary makes this a publication event not to be missed. 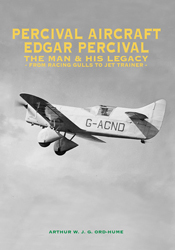 With the sub-title �From Racing Gulls to Jet Trainers �, this ground-breaking book will cause many a raised eyebrow amongst both historians and flyers alike for it reveals who really did design the Percival Mew Gull. The story also reveals the identity of the many people who helped Percival on his rise from a horse-breaker on his father�s Australian farm to a man who was known and respected the world over for his many amazing achievements.